Today’s call centers play a pivotal role not only in a company’s bottom line, but also in its brand perception. Obviously, improving quality is a huge component in both initiatives so it’s more important than ever to have a call center quality assurance framework fit for purpose and that supports quality assurance measures in every way. Your QA Framework should help you achieve the key goals of delivering excellent customer experience and improved brand loyalty. This blog is part of a series on improving the performance and quality of call centers. Click here for the best ways to measure call center quality assurance metrics. 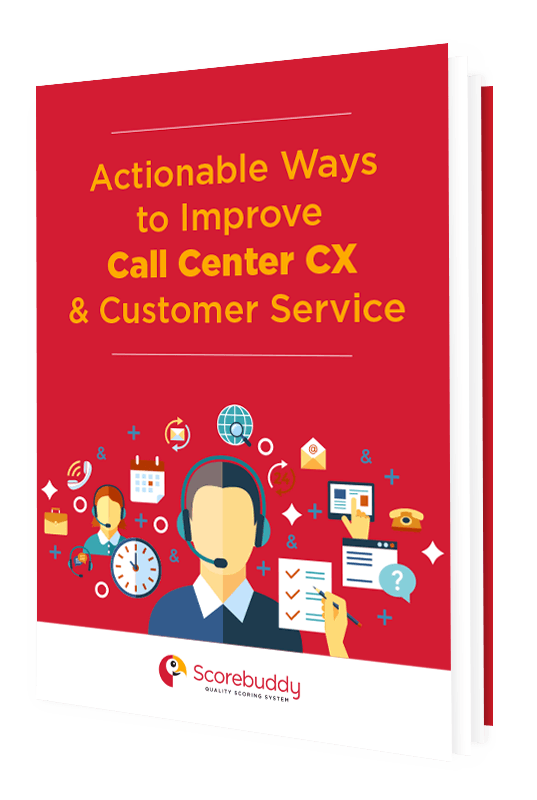 Learn how to design a call center quality scorecard and why this is a powerful tools for call centres. Learn actionable methods to help improve customer service in your organization. Those unrelenting objectives can be a challenge to maintain given the intense daily pressures placed on agents where competitors are pushing the bar ever higher. Finding ways to boost employee morale and improve skill sets using best practices is the only way to meet goals. If you’re short on ideas or just need a quick refresh, we have 5 can’t-miss tips to improve quality score in your call center. Of course, you monitor agent behaviors and performance but let’s take it one step further and establish team leader and agent coaching sessions. This may already be a part of your established process but Challenge the one to one experience, is it meaningful, informative and supportive? Depending on your operation, you may want to hold group sessions separately or in addition to, one-to-one coaching sessions. During these sessions, you’ll be able to present the relevant data team or individual data to the agents needing help. Using metrics and real situations, you can provide concrete examples as proof points. This will not only reinforce the need for renewed effort but also show that the corrective measures are not personal because they are based on data proof points. These meetings should be great opportunities to not only teach new tactics but also reinforce the quality standards of your center. Opening group sessions to discussion will encourage participation which is a wonderful way to get agent buy-in on necessary changes and help them understand your business goals. Peer-to-peer coaching sessions like these improve quality by engaging employees who are eager to support quality initiatives when they have had input. Again, data comes into play to support your coaching efforts but when you engage on a regular basis, you’re able to give real direction at a time when the less-than-perfect behavior occurred. This will show agents that you are vested in their improvement and it prevents bad habits from being established as routine. 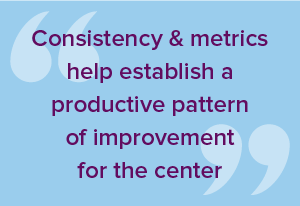 Consistency counts and when it’s supported by metrics, you’ll establish a productive pattern of improvement for the center. Data that stems from quality monitoring often produces the most important results due to the tangible nature of what it reveals. Through easily measured analysis and metrics, performance can be immediately noted and improved when necessary. The analytics can establish a good foundation for scorecard evaluation standards leading to invaluable insight on agent performance. The raw data will also help you flag processes which need improvement to further better agent performance and, ultimately, better customer satisfaction. What exactly are you listening for when you monitor calls? What scorecard metrics are critical to your customers, what scorecard metrics are important to your business? Are you hoping to hear just satisfactory performance or do you want to ratchet up to outstanding levels? Determine the measurable criteria that will get calls to that higher level and then work them. 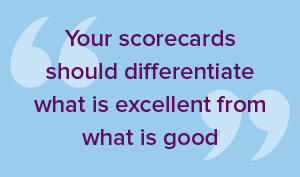 It’s tremendously beneficial to create scorecards that differentiate what is good and what is excellent. Defining measurable skills and then engaging agents to help determine criteria further integrates them into the metrics process and support of quality overall in the call center. When employees have input into processes and definition of metrics, they will be more inclined to work harder to achieve performance goals and support your overall quality objectives. 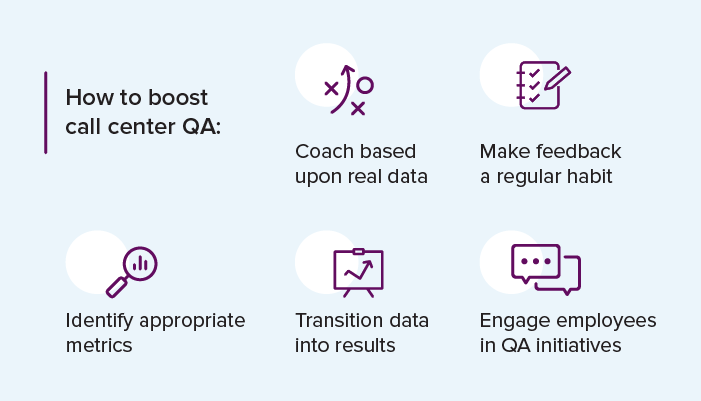 Giving them the opportunities to collaborate and provide peer feedback via group sessions can also go a long way in getting agent buy-in to your QA objectives. Once you have a great system in place for agent engagement, you may want to consider inviting customers for their input as well. They will have business and customer experience perspective that can help with improving agent performance to support quality assurance initiatives. Managing a call center is an ongoing process of anticipating and responding to customer and caller needs and it can be a challenge to think about upgrading quality assurance. However, if you just make a few adjustments with the help of these can't-miss tips for improving quality score in your call center, you’ll see a marked improvement in your quality assurance initiatives and a better outcome for your call center.